Shaheed Bhagat Singh Nagar district was created out of Hoshiarpur and Jalandhar districts of Punjab on November 7, 1995, as the sixteenth district of Punjab State named from the headquarters town of Nawanshahr. Nawanshahr town is said to have been built by an Afghan Military Chief, Nausher Khan. 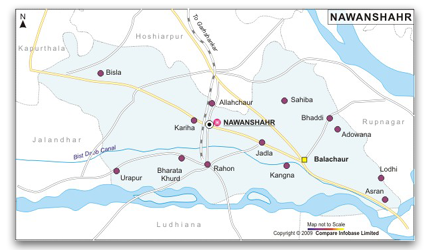 Previously it was called "Nausar" but with the passage of time, the town came to be known "The Nawanshahr". People of this district are economically sound. Large numbers of families from the district have settled abroad. Consequently huge remittance is being received back in India which contributes to the district's economic development and prosperity. 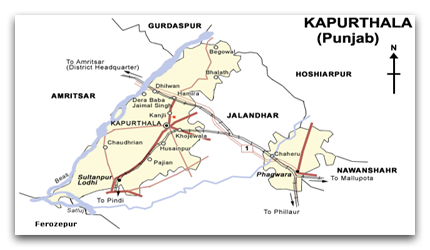 Kapurthala District is one of the smallest districts of Punjab in terms of both area and population, with 754,521 people by the 2001 census. The economy of the district is still predominantly agricultural. The major crops are wheat, rice, sugarcane, potato and maize. The major portion of Kapurthala district lies between the Beas River and the Kali-Bein River and is called the ‘BET’ area. This area is prone to floods. Water logging and alkalinity in the soil is the major problem of the area. A flood protection bundh called ‘Dhussi Bundh’ has been constructed along the left bank of the Beas River, and it has saved the area from the ravages of flood. The entire district is an alluvial plain. To the south of the river Black Bein lies the tract known as ‘Dona’ meaning the soil formed of two constituents i.e. the sand and clay.